“Angle shooting” is another type of advantage play. “Angle shooting” refers to legal but possibly unethical ways to beat card games. However, when the term “angle” is applied to gambling situations outside of the poker world, it often drops its negative connotation. A sports or horse bettor can have an angle which is perfectly legitimate and requires no malfeasance. In this context, an angle simply means a path to profit. In short: In card games, angle shooting means using unfair tactics. Angle shooting is most often used in Poker and online Poker but technically, angle shooting is possible in all card games. Angle shooting is definitely unethical. There is a dispute on what is considered angle shooting and actual cheating. However, the line seems to be blurry and the difference is likely only a matter of degree. working ,reliable method of gaining advantage under special circumstances. Angle shooting in Poker is controversial. This can get you banned and can ruin your reputation. Let’s look at different techniques used in Poker to better understand angle shooting. Out of turn a player declares they just hit a great hand, and you muck your own hand in desperation. However, the angle shooter has a different hand, than expected; a lower hand than the one you held. Declaring cards you have before your turn or before you have is considered cheating in most games. You are raising by 100 chips. However, the angle shooter only puts in a slightly lower amount but makes no comment about it. You assume he’s called, and you show your cards. If you won, the angle shooter will point out that his bet wasn’t actually completed, so he didn’t really call. If he won, you’ll likely never know anything untoward has happened, as the angle shooter will collect the pot directly. This happens when someone makes a move that can be interpreted as a check but is not complete, such as a wave of the hand. They can do this to see what everyone else has been planning to do and after everyone else checks behind they may announce that they want to raise. Angle shooting is not restricted to brick & mortar gambling. Angle shooting is possible online as well. A player leaves a ring game aright after winning big. He returns immediately after ,with minimum stack. Many online poker rooms have rules against this kind of behaviour, but not all of them. Temporary disconnection issues are a huge headache for most online casinos and online poker rooms. Therefore, online casinos introduced “disconnection protection”. 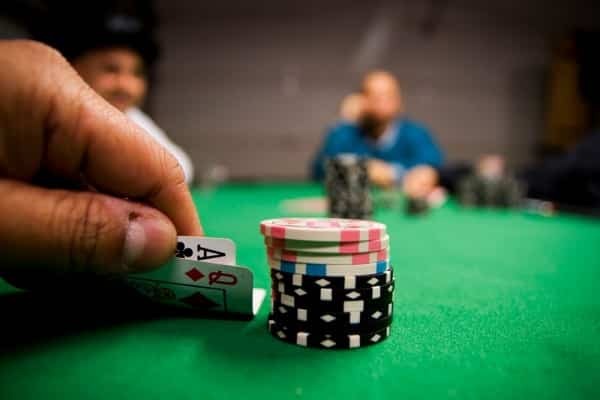 If you have money in the pot and get disconnected, you will stay in the hand as if the amount you added was going all-in. The hand will stand until the showdown regardless of whether others raise. The angle shooters abuse this by disconnecting on purpose so their current bet can ride until the showdown. Many online casinos and poker sites have outlawed this kind of behavior and have strict rules to discourage this sort of activity. They can ban you from the online casino and forfeit all your winnings. In our high-tech times, data mining became another concern at online Poker tables. This is the systematic collection of hand histories, enough of which can be used to profile opponents using specially designed software. Two or more players may agree to share their individual hand histories amongst themselves; alternatively, some websites like HH Smithy and Pokertableratings.com offer large quantities of previously-played hands (even millions) for a fee. Using software to analyse one’s own histories is generally accepted, but acquiring histories of hands in which a player did not participate is sort of a grey area and can be considered a kind of “digital angle shooting”. I do not recommend you to use angle shooting techniques, as they can get you banned from an online casino, moreover, it can also lead to your winnings being forfeited. Angle shooting (in particular angle shooting in poker and online poker) examined. Different angle shooting techniques, such as fake hand, incomplete call, ambiguous call or "going south" explained.